Well, the time has come for my 2nd post op. I went in and the doctor evaluated my leg again. Asked me how things were going and how I felt. It was pretty short and fairly uneventful. I was given clearance to turn in my knee scooter and was advised that I would be FWB in the boot from here on out. My doc told me that I will be wearing my walking boot 100% of the time and after about a week that I could start going without the boot while at home. She also adjusted the angle of my boot from 15 degrees to 5 degrees. Lastly we spoke about what would happen at my next appointment which was scheduled a month away. She said that I’d need to bring a left shoe because I’d be losing the boot that day and back into two shoes! And she said isn’t sure if I’ll need formal physical therapy yet but I do know that I want PT and I will be requesting it for at least a month. That’s it…after our meeting, I gently walked out under my own power. It was a wonderful feeling. I didn’t waste any time driving back to the medical supply place and returning the knee scooter so I wouldn’t be tempted into using it anymore. That actually isn’t a temptation at all…I’m rather glad to be rid of it. I was thankful for it’s usefulness but loathed lugging it around everywhere I went AND having to explain why I had it to everyone! I had my first post op appointment approx 2 weeks after my surgery date. If you read my last blog, you’ll recall that I had a spill on my “death mobile”…I mean, knee scooter! Oops! I haven’t had any pain or lasting effects from my fall and I’ve been very much looking forward to getting my stitches removed. During my appointment after my fall I received an ankle wrap which has gotten loose from time to time. It wasn’t a big deal for me to unwrap and rewrap my foot in order for the ACE bandage to stay nice and tidy. 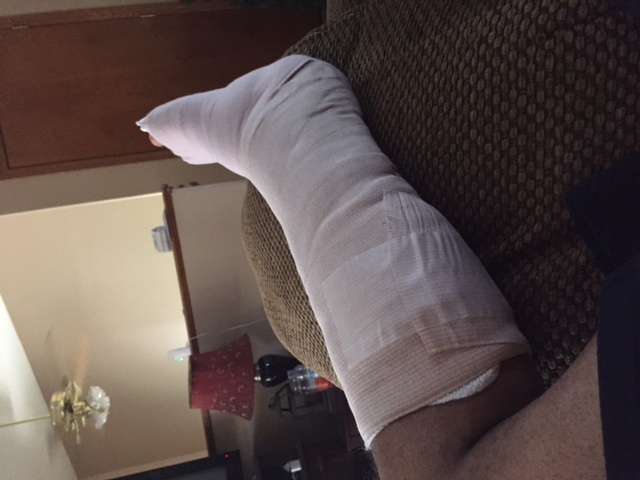 I was also able to unwrap my foot in order to clean my leg and foot for the first time since my surgery. That was a nice feeling. I used baby wipes as to not contaminate my incision and I didn’t do much to clean around the stitches, I just left it alone. My appointment went well and was pretty uneventful. The doctor palpated my tendon and confirmed that it was still attached and said it felt good. She did some small ROM exercises with me and advised that I would do some dorsiflexsion of my foot but keep it minimal as to not stretch the tendon while it was still in the healing phase. She removed the stitches, which I expected to hurt a bit, but I hardly felt it. After she removed the stitches I spent a few moments gently scratching/itching my incision site. She looked at me strangely and asked if everything was okay and I said I was great and it just felt good to itch my leg a bit. Toward the end of the appointment, which was pretty short, the doctor advised that I would remain NWB for another 3 weeks, until the next appointment. I’d have to say that I wasn’t entirely pleased with the 3 weeks which was 1 week past the minimum time frame she had initially told me on surgery day, but what really could I do? I chocked it up to my accident 1 week post op. And right before I left, she told me that I’d be losing the knee walker after the next appointment. As this was pleasant news to my ears, I was a little concerned because I didn’t feel like I’d be ready. On top of that, she said that I’d roll into the appointment and at the end I’d be WALKING OUT! This was a shocking turn that I hadn’t expected and I did not believe that I could be walking in 3 weeks. Again, it was pleasant news that excited me and I want nothing more than for that to be true and to walk out of the appointment in 3 weeks under my own power on my two feet. I know I’ll be weak but weakness is only temporary and strength will come back over time. I’ve been sitting around being pretty sedate after my injury and even more so after my surgery. I can literally feel that I’m more exhausted now doing menial things than I ever had been in the past. I determined that it was time for me to get back into the gym. Aside from that, I know that increased bloodflow always helps with the healing process and nothing gets the blood moving more than exercising! I got back to the gym and had to improvise some things in order to get the job done. I began with using the row machine. I was able to successfully row by putting my good foot in the foot strap and resting my injured foot on top of the foot rest area. I was able to row only using one leg and having the injured one doing nothing. It was tough at first and I didn’t row very far or very long as my cardio was shot, but things have improved over the past couple weeks. I also have been using the Airdyne bicycle and using my arms and good leg to get my workout. I, again, just let my injured leg sit on the peg below the handlebars, doing nothing. Finally, I’m able to utilize some free weights here and there. Its more difficult to get and use heavy weights while NWB but I was still able to get the flat bench close enough to the weight rack to use dumbbells and again, get a good workout in. So, I’m proof, this injury is no excuse to not workout and continue to be somewhat active. It just takes a bit of motivation. I hate not being able to do the job I love and my motivation to get back to work is the reason I refuse to stay sedate. The faster I heal, the faster I can come back to work. And that’s my desire at this point. So Monday was supposed to be a great day. I was going back to work 7 days post op. The surgery went well and I had been 7 days pain free. I was in a splint and had been mobile using a knee walker. Hi Ho Hi Ho…It’s off to work I go! The day started off well, I checked into work and they lined out what I’d be doing and how to log my hours. I work as a firefighter/paramedic so I haven’t had a time sheet for years! It was new to me…haha. My light duty job would be as a paramedic instructor for our dept medic program. Not bad…beats pushing papers. It’s M-F which is like torture…I’ve been used to working 24 hr shifts with 48 hrs off between shifts (BTW..it’s awesome.). Anyway, I was directed to go sit in the class and observe and be expected to get right after it the following day. 3 hrs after getting there, IT happened. Murphy and his damn law showed up! I guess the ATR wasn’t enough! I was to include insult to said injury as well. I was moving across the parking lot and hit a dip/crack/perfect storm which jarred my knee walker handles one way while my body went the other way. OS: You will stay NWB for at least 4-6 weeks. Me: You got it! Zero weight. I suddenly find myself falling forward with the walker between my legs and involuntarily thrusting my 7 day old surgically repaired leg toward the ground to break my fall. I remember thinking, as I fell in what seemed like slow motion, NO NO NO NO NO NO!!!! I crashed to the ground and felt my foot damn near touch my shin! Well, that’s what it felt like in my head. I knew instantly I’d screwed up and screwed up Huge! All I knew is that I needed to get to my Dr right away. I called the Ortho right away and demanded (kindly, by explaining my predicament) that I speak to my OS’s tech right away. I was able to get to her and explain what happened. She made me an appt for the next day as my OS was currently in surgery for the day. The rest of the day was choked full of fear and regret and anger and fear and more fear. Did I mention that there was some modicum of fear? As for the pain…Nothing hurt, but it didn’t hurt before the surgery either so I could’t be certain that I hadn’t reinjured my AT. I could move my foot and I could feel my calf activate with movement of my foot too so I assumed it was good sign. Still the fear persisted. At the appt, my splint was cut off and I viewed my leg for the first time in over a week. It looked…like I’d had surgery. Still didn’t hurt, wasn’t swollen. Dr did her thing and politely, as if ribbing me, told me she wouldn’t have expected anything like this from me and thought that I’d be more coordinated….Har har. I relayed that I felt the same way. She touched and poked and prodded and stated that the tendon was still intact and that I’d be fine. Still I was leery. Happy! But leery. They fitted me for a boot set at 15° plantar flexion and told me to come back next week to get the stitches removed. She told me to keep it dry and I can now take the boot off and begin moving my foot gradually. With that, I was released and I left. As soon as I got home I removed the boot and decided that I wasn’t ready for 15° after my fall and that I’d rather stay plantar flexed at 22.5° instead. I readjusted it myself to 22.5° and now feel much better. I feel that if I did stretch things out a bit when I fell that 22.5° would be better for letting things settle down in hopes that I don’t heal long. Feels good. Lastly, as if this weren’t long enough, I decided to order a VACOcast pro! I found one on eBay and won the auction at far below retail. I can’t wait to get it and try it out and ditch this Frankenstein-esque boot! Moral: please be careful guys! Don’t fall and tread lightly on your knee walkers and crutches! That was a day of woe that I hope K never have to relive! The rest of the week went pretty smoothly. I rested for the most part and kept my leg elevated. I continued to use my medication cocktail of Men’s One-A-Day, Norco, Potassium, and stool softener. I’d have to reiterate that when taking some type of opioid pain killer that you also take a stool softener. Opioids can and will cause severe constipation and it’s best to get out ahead of it before it’s a problem. 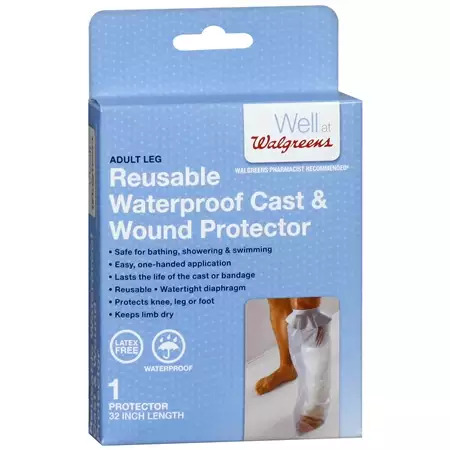 I did manage to pick up a cast cover to aid with taking a shower. I’m not much for taking baths so I took showers and the cast cover did the trick. I also didn’t bother to get a shower chair as I was able to get in and out of the shower with ease by sitting on the edge of the tub and swinging my legs inside and then standing up. It was a bit tedious but not as tedious as trying to maneuver a chair in and out of my tub on a regular basis. I was also able to stand up easily using one leg, so if you’re someone who isn’t able to do that for whatever reason then I’d suggest taking a bath or using a shower seat. Keep in mind that if you choose to shower and go without a seat then you will be doing it balancing on one leg. Again, that’s something that wasn’t tough for me because my able leg was easily up to the task. That may not be the case for everyone. Just be smart and use common sense. There’s no rewards here for bravery and the risks are very high in case of a fall. Oh, and lastly about the shower…bath mat….bath mat…bath mat. Don’t slip and fall! It hurts and it’s embarrassing to have to call 911 for the fire dept and paramedics to come hoist your wet naked injured body out of the shower. For one, it’s not easy. And two, you don’t look as good naked as you think.. haha. I don’t say that from experience as the guy in the tub….I say that as the guy who has to come get you out! So, like I said, the week was pretty uneventful. I took a shower. That was exciting. I weaned myself off of the Norco by Thursday evening. My pain has remained at a zero or near zero so I’m very thankful for that. And then the weekend came. The weekend came and brought with it 103 degree F days with little to no help from our air conditioner. Yes, I realize that I’m complaining about A/C when many people of the world can’t even fathom the concept. Sorry. It was HOT. My kids, although I love them to death, were loud and needy. I was tired. All the moving around from the day was getting to me and eventually I blew my top a little bit. It was an accumulation of frustration from being injured, not being able to totally fend for myself, being hot (I hate being hot), being tired, moving around much more than I had all week, constant noise (my son hasn’t stopped talking since the day he learned how to make noise and he has no idea what an inside voice is! ), being stuck inside almost all week, and every little stressful thing that makes up a normal person’s day. All these things collided at one time and I just blew up. I yelled at my infant daughter (not a proud dad moment…shame), snapped at my son and wife, had a pity party for myself and pretty much just shut down. It didn’t last long fortunately but it was a quick look at how the little things add up and how easily they can boil over. I eventually apologized and spend the rest of the evening with my wife next to our fire pit enjoying a cold (much needed) beer. Sunday was better. The temp was down and I knew a little bit more of what to expect of the day so all was well. I was nervous about going back to work the next day as I wasn’t exactly sure what I was going to do. Going back to work was 100% my decision. I could have stayed out and I had more than enough sick time to do so but just don’t like the thought of using sick time when I don’t really need to. Well, in hindsight, I should have stayed home ONE more day but there’s more on that to come. It’s its own fun filled adventure chocked full of terror, suspense, fear, uncertainty just to name a few! I woke up at a normal time and to my amazement, I still felt like a champ. Pain still nil. I had an orthodontic appointment at 9 am that I wasn’t sure prior to the surgery that I could make it to but I felt like it wouldn’t be a problem once I woke up and felt the way I did. In fact, I considered driving myself to the appointment even though I was told not to drive any vehicles for at least 24 post op. I had already spoken with my mother about giving me a ride around town in the morning to run some errands so I just let her take me even though I felt good enough to drive. Turns out that I’m very glad that I did. Once I got up, started moving around and about halfway to the orthodontist’s office I felt sick to my stomach and a little woozy. I breathed my way through the sensations, sucked it up and didn’t say anything. The dentist trip went well and was fairly quick, the next stop would be the voting booth. I can’t pass up my opportunity to vote….its my right and it’s very important. The voting site was not busy at all and after explaining to the booth workers why I was all bandaged up and on a knee scooter, I cast my vote and went on my way. During this time I found that I was quickly moving downhill. I felt groggy and tired and the nausea had returned. Upon leaving the voting site, I mentioned needing to renew my driver’s license and my mom said it was no problem for her to run me over there. By this time I was barely hanging on, the grogginess was increasing but fortunately I still had no pain. We arrived at the DL office and I could see from the outside that I wanted no part of waiting in line or dealing with renewing my license at this time. I told my mom, no way….I can’t do it…take me home. I was home 5 or so minutes later. I took my meds as I was up against my 4 hrs since I’d last taken them, got a small bite to eat and laid down. That’s the last I remember. I passed out and was out for hours. Looking back, I think that with all the moving around that I did that morning I mobilized any latent anesthesia still in my system which proceeded to bring back the nausea, grogginess and eventually an unconscious state. Oh well…at least I got a nap. After i woke up I felt fine and the rest of the day was uneventful. For informational purposes only. Here is my MRI report on my ATR. TECHNICAL FACTORS: Sagittal, coronal and axial imaging was performed using T1-weighted, T2 weighted, and fat-suppressed imaging techniques. FINDINGS: A high grade tear of the Achilles tendon is identified approximately 8 cm proximal to the calcaneal insertion. 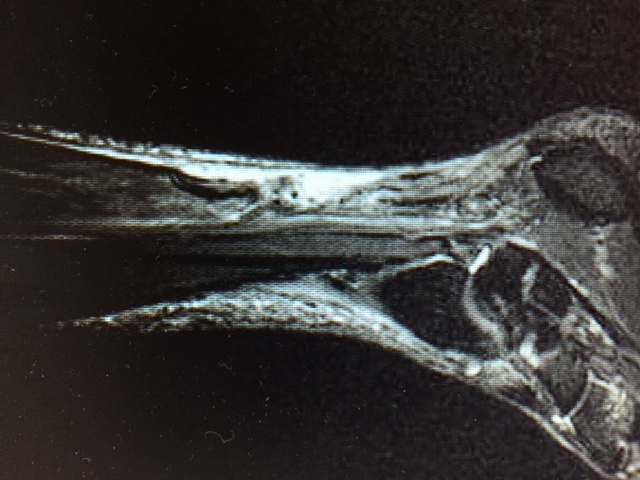 Only a markedly attenuated remnant of the Achilles tendon appears to remain in continuity. Retraction of the proximal mytendinous fragment is identified and the proximal and distal fragments are separated by a fluid-filled gap measuring approximately 3 cm in length. Marked thickening and abnormal signal intensity involve the distal tendon fragment consistent with intratendinous edema and hemorrhage. Marked adjacent soft tissue edema is observed. The tibialis posterior and flexor tendons appear intact but mild increased fluid surrounding the tibialis posterior tendon is observed. No tarsal tunnel mass is identified. The tibialis anterior and extensor tendons appear normal. The peroneus longus and brevis tendons appear intact. No acute osseous injury is identified. Edema involving the distal soleus muscle is observed compatible with strain. The anterior and posterior inferior tibiofibular ligaments appear intact. The anterior and posterior talofibular ligaments appear intact. the calcaneofibular ligament and deltoid ligament appear normal. There is no evidence of transchondral injury involving the dome of the talus. The ligaments of the sinus tarsi appear normal. High grade tear of the Achilles tendon approximately 8 cm proximal to the calcaneal insertion. The retracted proximal tendon fragment and the thickened distal tendon fragment are separated by a fluid-filled gap measuring approximately 3 cm in length. Only a markedly attenuated remnant of the medial aspect of the Achilles tendon appears to remain in continuity. Pics of MRI - sorry I am unable to rotate the pictures so they are upright. If anyone was curious as to what exactly is done during an ATR repair I’ve transcribed the procedure notes for anyone to take a look at. It is not to be implied that if you decide to have operative ATR repair that this will be exactly what happens but it’s just a general overview of what to expect. 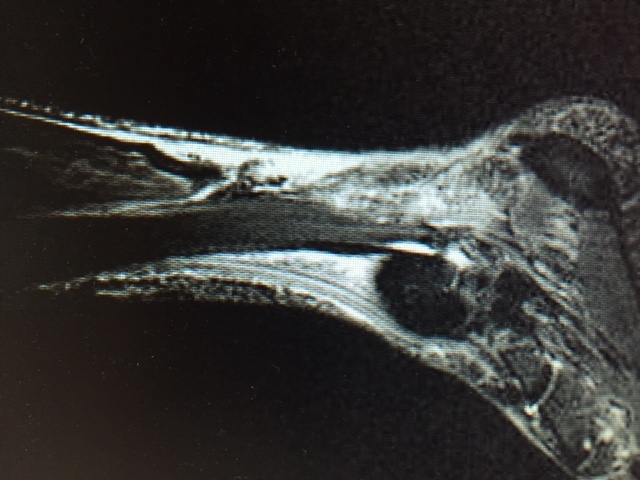 Patient suffering a Left Achilles tendon rupture. 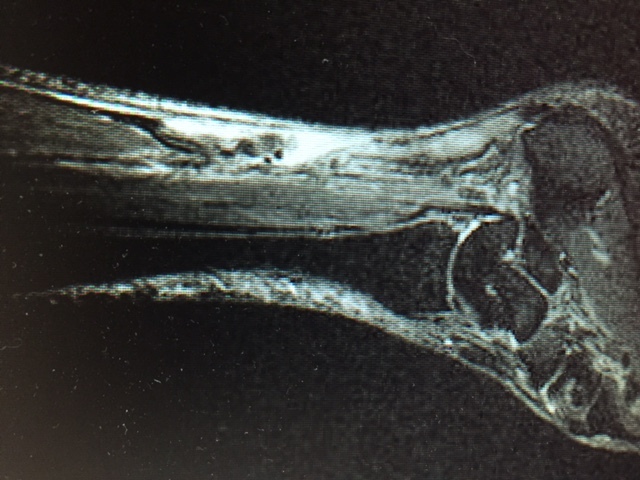 Patient was seen and noted to have a gap and the tendon edges were not able to be approximated. We had discussed nonoperative functional bracing versus operative management and given the risks and benefits of both, patient wished to proceed with operative management. Patient was seen in preop holding area. Proper site of surgery was marked. Patient was taken to the operating room, positioned supine. General anesthesia was administered. A nonsterile carefully padded tourniquet was placed onto the Left upper thigh and the patient was then placed in the Left lateral decubitus position with all pressure points padded including an axillary roll. The leg was prepped and draped in usual sterile fashion. Leg was exsanguinated and the tourniquet inflated to 290 mmHg. A medial approach to the Achilles tendon was performed. Paratenon was opened. The tendon was completely ruptured. Both edges were cleaned up so the frayed edges were minimized and number 2 Tycron was used in a modified Krackow stitch. A 4 core suture repair was performed. The same procedure was done on the distal segment. Once the 2 segments were prepared, the foot was plantar flexed to a neutral position, and the sutures were tied completely. A running 3-0 Monocryl was used for an epitendinous stitch. The paratenon was then repaired using a 3-0 Monocryl, the skin with an interrupted 3-0 nylon. 20 cc of 0.25 percent plain Marcaine were infiltrated in wound edges. Sterile dressings were applied. A splint in equinus was applied and the patient was brought to the PACU in stable condition. I was present for all portions. XXXXXXXX, CNP was utilized given the complexity of the case, need for skilled mobilization and retraction. My Pre-Op was scheduled for 2 days after I found out my results. It was pretty uneventful and mostly just the surgeon explaining the procedure and what to expect afterwards. I came loaded with questions since it’s been 2 full weeks since my injury and all I’ve done is read about ATR everything! The doc was very patient with me and my list…literally a list that I wrote and brought with me. It was nice to have all my questions answered and I was able to leave with a good feeling about the upcoming procedure. In fact, I was very excited that my recovery now had a direction and I was on my road to getting back to life as I once knew it. One thing of note that my surgeon told me before I left. She said that I would be asked on the day of my surgery if I wanted a nerve block. She told me to tell them no. She said it is one of the least painful procedures they do and it’s not necessary. She stated that it was a short procedure, that I’d be intubated with an LMA and, to my pleasure, would not be needing a urinary catheter. My surgery was scheduled for the following Monday (pre-op was Fri). This day could not have come soon enough! I was almost giddy to have this surgery done and couldn’t sleep the night before because I was excited. That morning, I helped my wife and kids get ready for work and daycare and waited for my mom to come and get me. My surgery was scheduled for 12 noon and was instructed to arrive at 1030. My mom gave me a ride to the hospital and waited with me until it was time to start the operation. I had a knee walker delivered to the hospital for me to use once I was done. The surgeon came in again and marked the correct leg that was to be operated on and the anesthetist came an let me know what to expect. A nurse started an IV and after a little waiting it was time to go. I walked into the OR under my own power and jumped up onto the bed. The room was very cold. There were people milling about and I wasn’t worried or concerned. The CNA placed an O2 mask on my face and was talking to me until…I….uhh…..
Ok, time to wake up….wait..what…done? Huh…that seemed quick. Yep, done. Upon waking up, I felt groggy but not bad. It took me awhile to become fully coherent. My wife had arrived to take me home and she told me that the Dr had called her and said everything went well. She said that she stitched my AT little tight so that I had the best chance for regaining as much strength as possible and to lessen the chance of healing long once things got stretched out. I hung out for a little while and then they said I was good to go. I didn’t feel any pain but that was normal due to the anesthetic and I no longer had a lower leg. It had been replaced with a big splint (no cast) that I was told couldn’t get wet and that I had to keep on until my first post op. Boo… Oh well, time to go home. Discharge was easy and I was able to use my knee walker immediately. My wife drove me to the pharmacy and we picked up my meds. I was given Norco. Prior to my surgery, I picked up some potassium to combat cramping, vitamins because I’d probably not be eating much and stool softener because opioid induced constipation is a very real thing! haha. The rest of the day wasn’t bad. I laid on the couch with my foot elevated and relaxed as best I could. My mom brought my son over to say hey but took him to her house for the night. I needed some piece and quiet and my boy has more energy than 10 puppies. haha. Everything was simple and up to this point I’ve had no pain. I really wish that I had more to report after the procedure but it really was uneventful. We’ll see how tomorrow goes…. So it took about a week but I finally got the official MRI report back from the radiologist. He states I have a high grade tear approx 8 cm proximal to the insertion of the calcaneus and approx 3 cm gap in AT. He also stated that all other tendons, bones and muscles are unaffected. So, that’s it. It’s broke and it’s broke good! It’s decision time. Well, in the last week, I’ve had a lot of time to think about how I want to proceed pending the results of the MRI. I originally was leaning towards the Non-Op route but have since fully, 100% changed my mind! A few factors were present in my decision making process and since I’m a very logical thinker by nature I spent a long time rationalizing it. 1. I know the AT is a tendon and not a bone and any healing done is inherently not as strong as the original and therefore will be weaker than it’s counterpart after healing. 2. The injury was described as two mop heads needing to be mended together as my tendon frayed instead of snapped. That said, I didn’t like the thought of trying to get the ends of the tendon close and just hoping that it would heal properly. 3. I fully believe that a repair that is secured with sutures is far superior than simple scar tissueholding the tendon together. To me, it was like having concrete with rebar vs concrete without rebar. The concrete with rebar will hold up much better than without. Also, add in the fact that the surgeon will visualize the tendon, debrade the tendon and then affix each side together securely. 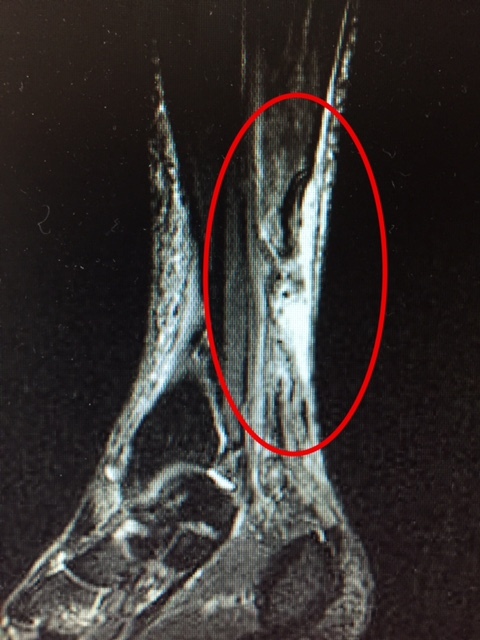 There’s no doubt that the tendon is put back together and not just left to chance. 4. And finally, the biggest factor is my profession. As a firefighter and paramedic I rely on the strength of my whole body, especially my legs, in order to fulfill my duties and provide the best service I can for the citizens that I serve. That said, it would not be fair of me to not seek the best treatment for myself and then place someone else’s well being in my hands. To me, a repair that is as strong and as sound as possible was the only direction that I could go and feel good about it. So that was it, the decision was made and after thinking it through, it was a very easy one. FOR ME. This decision may not be for everyone but that’s your own decision to make. The only thing I’d stress to anyone facing ANY medical treatments….don’t let people tell you what to do. Find out as much as you can about your condition and available treatments. Listen to wise people and hear them out and consider all options. If you ever don’t feel right about something, seek out a second opinion or even a third if need be. It’s your body and you have the responsibility to be your own advocate for your care. Once it’s done, you can’t complain about your treatment if you just sat idly by and did nothing or said nothing. So my appointment day finally arrives and I meet with the PA of the Orthopedist. He does the run of the mill tests for ATR and concludes what I already mostly knew. I have an ATR. No shocker there. He was pretty great though, he took as much time as I needed to explain the injury, the surgery, the kind of recovery time and answered all my extensive questioning. After he evaluated me he went and got the Orthopedist who is a good friend of my wife’s family. We made small talk and he checked me out again. He said it’s an ATR also but is unsure of the extent of the injury. We agreed that I should get an MRI even though I knew they tend to be quite extensive. As far as I was concerned, I wanted to know the FULL EXTENT of my injury, not just someones best guess. As far as the treatment was concerned, he told me that I had 2 options. I could try to go non-op or I could have surgery. If I got surgery then he said he’d be referring me to their foot and ankle specialist, which I was fine with and grateful to him for knowing his own limitations and wanting to get me to the best person possible for treatment. At this point, I was leaning toward non-op. I did not want the financial burden of having to pay my insurance deductible etc etc. I was totally thinking with my wallet at the time. At the end of the evaluation, he told me there’s nothing more we can do until we see the results of the MRI and make the decision on which treatment I would choose. The Dr put me in a boot with about a 2 inch heel lift to wear for the time being and to protect my AT until we know more. From there I went to the scheduling person to schedule an MRI. I had to wait until the next day to get in to the MRI. I’d have to say that I wasn’t quite prepared for the MRI as I believed I’d be. They ask if you’re claustrophobic and if loud noises scare you, to which I replied no. As a firefighter being in tight spaces and around loud noises are a common occurrence. Not that I”m saying that I enjoy those things, but I can handle them decently enough. Anyway, the MRI wasn’t what I’d expect. First of it was freezing cold! Which I understand but didn’t expect. They gave me a gown to wear and headphones tuned to the music station of my choice. I laid on the table and the tech arranged my feet in the configuration that he needed me to be in for the imaging. He lashed my feet together to make them stand upright which I think was the worst part. It was very uncomfortable to have my feet like that for so long. The tech asked if I was okay and then told me that it’d be about a half hour. I don’t know if I wasn’t paying attention or thought he was kidding but I didn’t think that it’d really be 30 mins! He left the room and the machine clunked and bonked it’s way to life. Um….I’m sure that MRI machines are very expensive and I know they’re technologically super advanced but this thing sounded like a large commercial dryer with cinder blocks inside. It was loud! So I settled in and just waited. I tried to sleep but I was uncomfortable so I couldn’t. I made the mistake of opening my eyes and catching a glimpse of the timer so then I stared at the timer count down to zero…then reset to another time…then countdown to zero…then reset again to a longer time….then countdown to zero…over and over for about 30-35 mins. Let me tell you….counting down every second for 30 mins is agonizing….especially since I was very uncomfortable. I was very happy when it was over. The tech let me out and let me change back into my clothes and helped me out. The images were available right away but I had to wait at least 24-48 hrs for them to be read by a radiologist. At least that’s what he told me. As it turns out, I got to wait a full week for mine to be read. In the mean time, I had access to the images and got to see my injury for the first time. I could see the abnormality and pooled blood. I could see that it was ruptured but I couldn’t tell if it was fully ruptured. It kind of looked like there was a teeny tiny bit of tendon still trying to hang on. firemedic1 has completed the grueling 26.2 ATR miles to full recovery!